Traditional Korean cuisine made from scratch daily. This delightful, family-owned Korean Cafe offers casual dining, excellent service, and fabulous food. Most of the recipes are old, traditional family dishes. One such dish is the cross-cut beef short ribs marinated using a recipe passed down from many generations in the owner’s family, served on a sizzling hot plate with rice and kimchi. The kimchi is made fresh every day. Another must-try is the Hotpot Bibimbap with beef, chicken, or spicy pork bulgogi served on top of rice and egg along with a variety of vegetables and sesame oil in a super HOT stone earth bowl served sizzling. *Warning* this is an extremely hot plate meal, please use caution when eating! Dosirak persevered through initial tragedy. Owners Sung and Youn Kim were just months from opening what they considered their American Dream when a fire at their home caused devastation. In May 2016 Sung died in the fire that ravaged the couple’s Conroe home. The restaurant includes a small market offering traditional Asian items, including ramen, seaweed chips, and sweets. Southern Living asks, got a few days to play? Whatever your budget, here’s a weekend for you. A sprawling, cosmopolitan wonder, Dallas is evolving minute to minute–often beyond recognition. So much so that even natives sometimes have to stop and ask directions on streets that they’ve been driving their entire lives. As fresh as the city is to them, it is equally so to tourists. That’s what people love about visiting Dallas–it’s full of new life and always on the go. In a mere three days, you can jump in and get lost in the rush. Whether your purse strings are threadbare or you’re using hundreds as hankies, you can truly enjoy Dallas. We have tracked fantastic dining, entertainment, and lodging at three price points. $: Good grub can come cheap, so this may be the category where you want to pinch those pennies. Simply sinful is the best way to describe Bubba’s Fried Chicken (6617 Hillcrest). Bubba’s, across the street from Highland Park’s Southern Methodist University, is famous for its rolls and fried chicken tenders. With butter, the rolls are good enough for Thanksgiving. With honey, they’re dessert. Another hot spot around SMU’s stomping ground is Burger House (6913 Hillcrest). They have mouthwatering cheeseburgers, but it’s the seasoned French fries that make grown men dressed in business suits stand in long lines during their lunch breaks. $$:To get double bang for your buck, dine at the young, trendy, and oh-so-yuppie Sipango (4513 Travis Street), where nightly live music and free salsa dance instruction on Wednesday nights make for especially colorful evenings. The Italian-influenced menu includes inventive pastas and wood-fired pizzas. Another see-and-be-seen spot is Primo’s Bar & Grill (3309 McKinney Avenue), a Tex-Mex joint where all the big-name Dallas chefs rally after closing their own kitchens. Although the outside of this hangout is unassuming, the chiles rellenos, flan, and queso are dazzling, not to mention the margaritas. For quieter dining, choose Celebration (4503 West Lovers Lane) where down-home cooking served family style is divine. In a converted old home, the chiming of “Please pass the potatoes” will remind diners of holidays at grandma’s. $$$: It’s a fact that Dallas has four times more restaurants per person than New York City. With that said, at least one meal during your visit deserves a splurge. Javier’s (4912 Cole), a longtime pillar in local dining. Let’s face it, Dallas is full of talk about Mexican food, but Tex-Mex is what they are clamoring on about, not real Mexican. Javier’s is the real deal. The snapper mojo de ajo and beef tenderloin tips are fabulous. $: Luckily, there’s tons to do in Big D that’s easy on the wallet. The first of these is to spend an afternoon enjoying art at the Dallas Museum of Art (1717 North Harwood). The monthly traveling exhibitions and literary series usually charge admission, but entrance to the DMA’s permanent collection is free. The Farmer’s Market (1010 South Pearl Expressway) is another fun freebie. Stroll through the sheds bulging with fresh fruits, vegetables, and plants. There’s even a portion of the market where Southwestern furniture vendors sell their wares. Just remember to bargain. While downtown, swing by Pioneer Plaza (at Young and Griffin streets outside the Convention Center). History books boast that it features the largest bronze monument in the world: three cowboys on horseback driving 40 longhorn steers. $$: For a stroll back in time, visit Old City Park (1717 Gano), a history museum made up of 38 historic structures dating from 1840 to 1910. The docents here, donning period costumes, are often natives who can tell plenty of when-I-was-little tales about growing up in this chic city. For the thrill-seekers, The Dallas World Aquarium & Zoological Garden (1801 North Griffin Street) has crocodiles, jaguars, and a 16-foot anaconda. $$$: If blowing some dough is the goal, you won’t have any problem in this city. Start at Neiman Marcus (1618 Main Street), the phenomenon that put expensive department stores on the map. Sure, you can simply stroll through the original department store for free, but that’s no fun. We’ve included it in the pricey section so you can save your milk money and buy a souvenir with true Texas style. By spending at the many boutiques in Snider Plaza, one of the oldest shopping centers in Dallas, you can rack up more frequent-flier miles on the credit card. If shopping’s not your bag, then there is no question where to indulge: a Dallas Cowboys football game. The local joke is that the reason there’s a hole in the stadium roof is so God could watch “da boys” play. Scoring tickets may take some smooth moves. $: For lodging in Dallas, the budget category tends to be weak, while the pricey category leans toward healthy. An honest-to-goodness gem in the city is Terra Cotta Inn (6101 LBJ Freeway). This inn feels like a bed-and-breakfast that just happens to be on one of the busiest highways in the city. We love it because it’s charming and affordable. In the winter, double rooms rent for $63 and deluxes go for $83. Beat that! $$: The Magnolia Hotel (1401 Commerce) is a new hotel in a historic building with rates that are hard to top for the convenience of downtown. Tip: Weekend rates are nearly half off weekday rates. 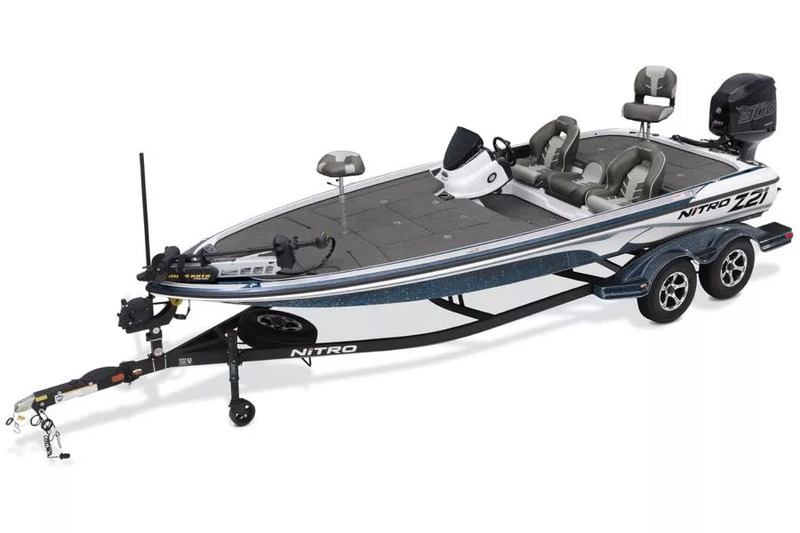 They range from $129 to $169. $$$: If you decide to stay at Hotel Crescent Court (400 Crescent Court; rates start at $235) or The Mansion on Turtle Creek (2821 Turtle Creek Blvd. ; rates start at $440), you may have to opt for low-budget dining and entertainment for the rest of the trip. But you’ll never have more luxurious and stately accommodations, and, boy, will your friends back home be jealous. Zagat Survey recognizes The Mansion as the number one hotel in the South. Dallas may tug a little on your pocketbook, but after 72 exhilarating hours, it’ll be worth the financial setback. Just think, when you’re ready for three more days, so much will have changed in Big D, it’ll be like visiting an entirely new city. “Dallas: Three Days, Three Ways” is from the November 2001 issue of Southern Living. Because prices, dates, and other specifics are subject to change, please check all information to make sure it’s still current before making your travel plans. There’s no stopping Snooze: An AM Eatery. Fresh off its announcement that the Denver-based restaurant will open near the Galleria comes word that the rapidly expanding brunch concept has also inked a deal on a location in The Woodlands. Slated to open in the summer of 2019 at 2415 Research Forest Dr., the new outpost will be the Houston area’s seventh Snooze, joining the restaurant’s existing locations in Montrose, Katy, Town & Country, The Heights, as well as two under development in the Galleria and Webster. At 4,400 square feet, the location will be among the largest Snoozes, which hopefully will mean a slightly shorter version of the restaurant’s famous wait for a table. It will also feature a dog-friendly patio. Original Article by Laurence Norah from findingtheuniverse.com. It is so very well done we had to share! Links to Laurence and his website are at the end of the article. Thinking about spending 3 days in Paris? Great choice! We think that’s the perfect amount of time to spend in one of our favourite European cities, giving you the chance to see many of the top sights and attractions and really get a feel for the city. Of course, if you have longer, that’s even better, but three days is certainly enough to see a lot. To help you with your planning, we’re going to share with you everything we think you need to know to spend three days in Paris. We’re going to give you a suggested 3 day Paris itinerary, tips for getting around, advice on where to stay in Paris, our thoughts on when is best to visit and even some suggested ways to save money in Paris. What better way to start of your trip to Paris than with a visit to the Eiffel Tower. This is without doubt the most iconic landmark in Paris (if not France! ), and a visit here is a must for any visit to Paris. When we visit Paris, we always visit at least once, and every time we are amazed at the sheer scale of this beautiful building. There are a number of ways to enjoy the Eiffel Tower. 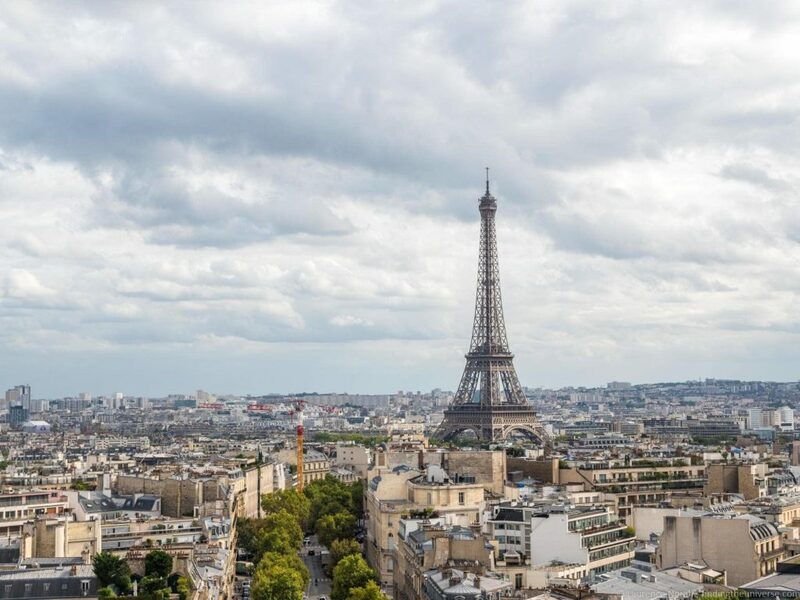 First, you can just enjoy the views of the tower, which we think are particularly good from the Trocadero Gardens across the river, or the Champ de Mars gardens behind the Tower. You can also go up inside the Eiffel Tower to one of the different floors, for expansive views of the city. We do like the experience of going up inside, but we don’t think it offers the best view of the city – because the view from inside the Eiffel Tower is missing the most famous part of the skyline – the Eiffel Tower itself! Still, if this is your first visit to Paris, we highly recommend the experience. We do suggest that if you want to go up the Eiffel Tower, that you book your tickets in advance from the official website. The queues here for tickets can be very long, and with a pre-booked ticket you can skip the wait. Alternatively, if you are feeling fit, you can also take the stairs up to the first level. There is not usually a very long queue for the stairs, which have their own ticket line, and it is also slightly cheaper. Another must-do experience in Paris is a river cruise on the Seine. This is a very popular activity, with multiple operators offering cruises up and down the river. We’ve actually written a post about the various Seine River cruise options which goes through the majority of the operators and the different types of trip available. We can definitely recommend the Bateaux Parisiens River Cruise. These depart from just next to the Eiffel Tower, so fit in nicely with this itinerary, and they are included for free if you pick up a Paris Pass. The cruise takes in all the highlights from the Eiffel Tower to Notre Dame, and there’s commentary included. So sit back, relax, and let the scenery roll by. Talking of sitting back and relaxing, we find that a great way to get oriented in a new city and get an idea of the sights we want to see is to take a Hop On Hop Off (HOHO) bus tour. Paris is no exception to this rule, and you can pick up a HOHO bus in Paris from right next to the Eiffel Tower, which will then take you around Paris’s key attractions. There are multiple operators running different routes around the city. 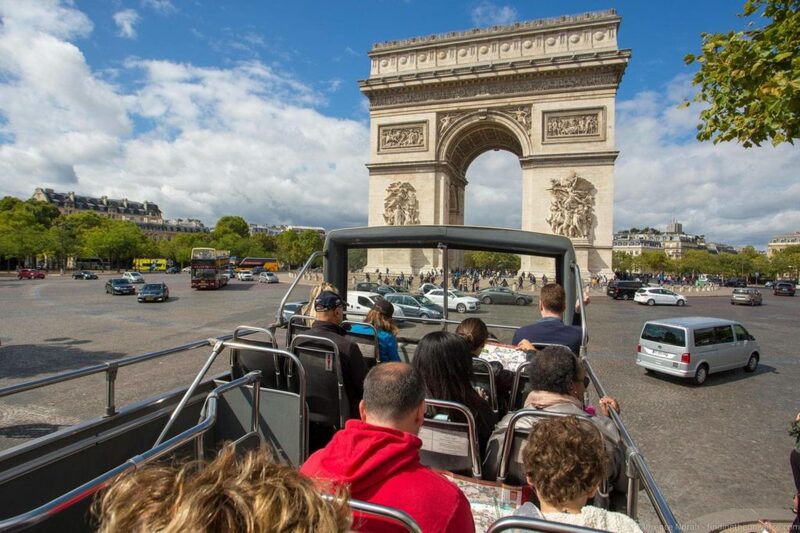 If you pick up a Paris Pass, it includes a 1 Day Big Bus Tour. We took this tour and enjoyed it – it’s both an easy way to get around the city, plus you can learn about many of the sights as you go. However there are a few different operators, so pick the one that works for you! 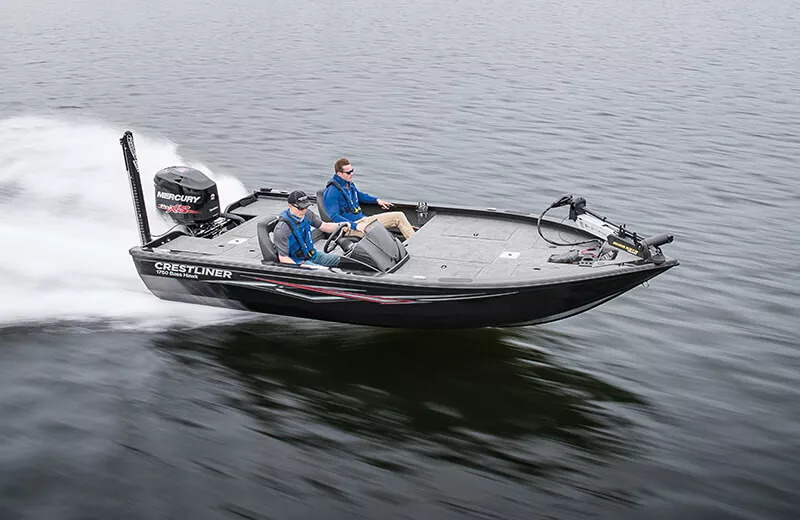 All this sitting around on buses and boats is great for getting oriented, but at some point you’re going to need to put your feet on the pavement! Paris is a wonderful city to explore on foot, and a guided walking tour is an excellent way to do that. We think that if you are going to do a walking tour in a city, the first day is the best, as you can ask your guide for local recommendations such as their favourite places to eat or get a coffee, as well as get suggestions for hidden gems you might not find in the guidebooks. There are lots of operators offering tours in Paris. We’ve taken a number of walking tours with Context Travel, and have always loved their detailed tours. They have a number of tours available in Paris, and you get 10% off with this link. We particularly enjoyed their Hemingway themed walking tour of Paris. We also love Take Walks walking tours, and they have recently launched a number of Paris Tours. For example, they have a Welcome to Paris Walking Tour with Notre Dame and Petanque, as well as a full day Paris tour, although the latter would require you to significantly alter this itinerary. If you have a Paris Pass, it comes with a free walking tour that focuses on famous filming locations in Paris, which is a lot of fun. Last on our list for your first day in Paris is a trip up the Tour Montparnasse. I recommend this to everyone going to Paris, as it is, in my opinion at least, the location with the best view of Paris and the Eiffel Tower. 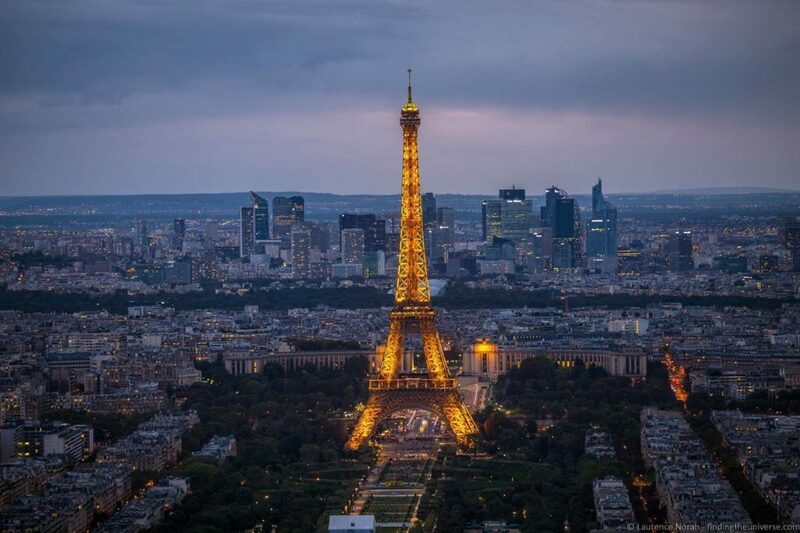 This is particularly the case at sunset, so if you can time your visit for sunset, you will get to witness a wonderful sunset across the Eiffel Tower, and then watch the city lights come to life. The observation level is across two levels, one is inside and one is outside. The outside area is surrounded by glass, but there are cutouts so you can get reflection-free shots of the view. You can also bring a tripod up here! No wonder therefore that it’s on my list of favourite Paris photography locations. There’s a fee to go up Tour Montparnasse, but it’s free for holders of the Paris Pass. Our second day in Paris takes in some more iconic sites including some of Paris’s most famous museums and churches. It’s quite a full day, so do feel free to edit the itinerary to suit your particular interests, pace and needs! It took me multiple visits to Paris before I finally made it to Saint Chapelle. Now I urge everyone to make it a priority on their trip to Paris! This is a relatively small chapel that is not too far from Notre Dame, but the interior, which consists of almost floor to ceiling stained glass, is absolutely outstanding. It will definitely take your breath away. The 13th century Saint Chapelle is quite popular, and the small size and mandatory security checks mean that the line to get in can be long. This is why I have put it on my list as the first thing for your second day in Paris – you want to get here early, ideally get in line ten – fifteen minutes before the opening time. After all, no-one wants to spend their time standing in lines. 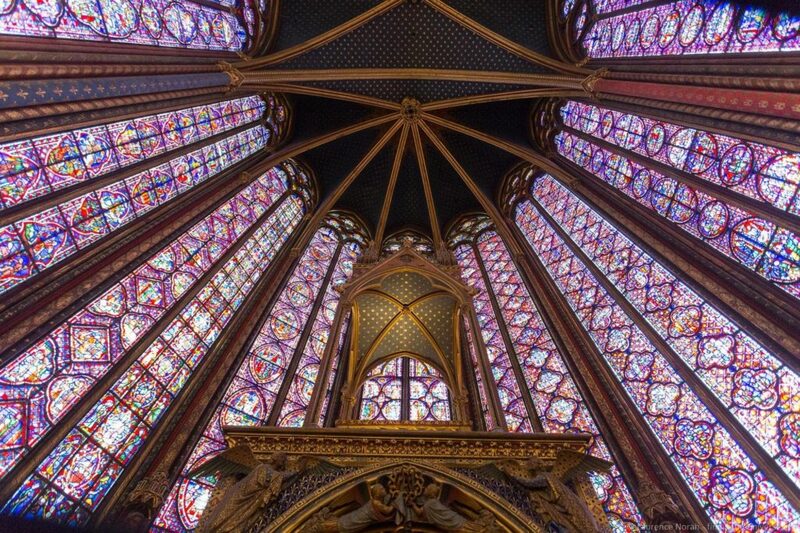 There’s a fee to enter Saint Chapelle, which is also free to holders of the Paris Pass. 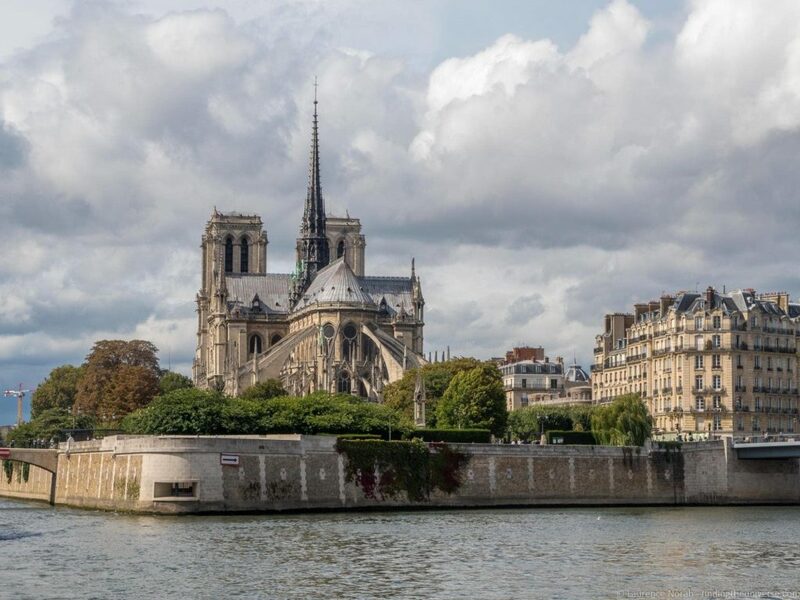 No more than ten minutes walk from Sainte Chapelle is Paris’s most famous religious building, known for her flying buttresses, twin towers and, of course, hunchback resident. You will definitely see two out of those three when you visit Notre Dame, the major Catholic cathedral in Paris. Construction of this magnificent building took nearly two hundred years, and was completed in 1345. Entry to Notre Dame is free, although you do have to go through security, and lines are sometimes long. If you wish to go up the tower or into the crypt, there is a fee for those activities (included with the Paris Pass), and you need to book a timeslot in advance. You can book this time slot on site at the ticket terminals. However, we suggest instead you do it using the “Jefile” app, available on iOS and Google Play. This starts accepting time slot reservations every day from 7.30am, so just set a reminder for yourself and book your timeslot well in advance on your day of visit, so as to avoid disappointment. If you like museums, Paris has definitely gotten you covered. Our next stop is the Musee d’Orsay, but before you get here, you’re going to take a walk along Paris’s iconic left bank, from Notre Dame to the Musee d’Orsay. This isn’t too far, but you’ll see the booksellers and get a feel for this part of town. Paris’s museums are quite logically set up, with three main art museums covering three distinct time periods. 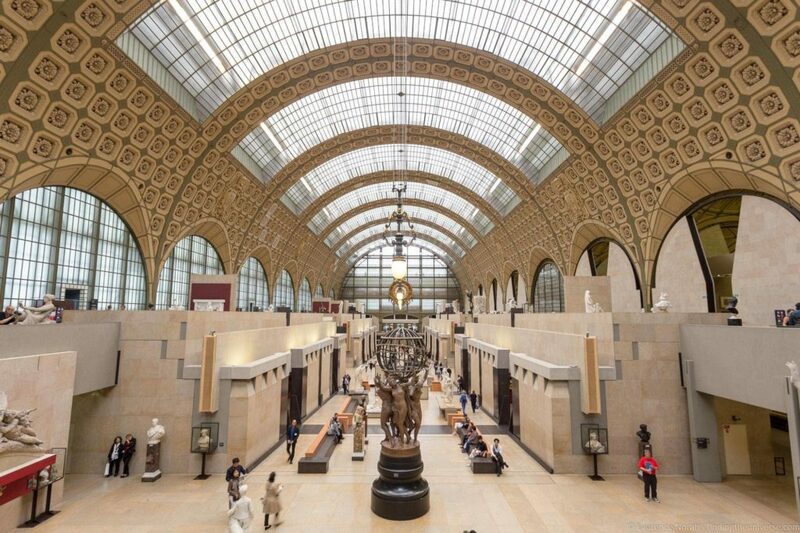 The Musee d’Orsay, first on our list, covers art dating from the middle of the 19th century up to the early 20th century, and is home to masterpieces from the likes of Duchamp, Kandisky and Picasso, to name but a few. The Louvre (see below), covers the time period before this, whilst the Centre Pompidou covers the time period afterwards, right up to the modern day. The Centre Pompidou isn’t on this itinerary, but you could fit it in if you wanted to of course! The Musee d’Orsay is absolutely stunning. It’s set in what was once one of Paris’s main train stations, and the grand central atrium is gorgeous – almost worth visiting in of itself. There’s a fee to get in here, but holders of the Paris Pass get free entry as well as skip the line priveledges. If you only visit one museum in Paris, I can highly recommend making it the Louvre. 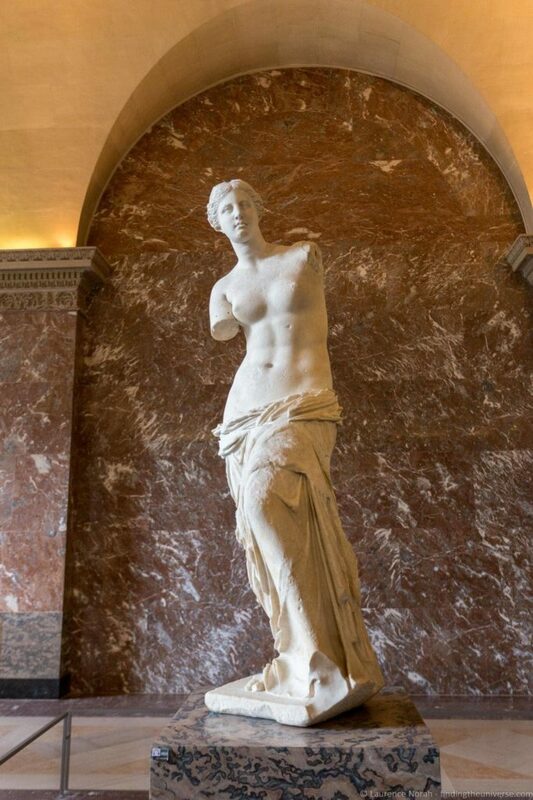 This is one of the world’s most famous museums, and is home to an incredible collection of art, including Da Vinci’s Mona Lisa, the Venus de Milo and Michelangelo’s Dying Slave, to name but a few. Obviously, seeing the Mona Lisa is on the wishlist for many visitors, but this museum, which covers art from ancient times up to the middle of the 19th century, has obviously got a great deal more to offer. True art lovers could lose themselves for days in the vast collection here! Of course, if that’s you, you are welcome to do the same, although for the purposes of this itinerary we’d probably recommend you try and limit your time to two to three hours so you can fit more of Paris in. We’d also highly recommend that you pick up either a Paris Pass or a Paris Museum Pass, which will give you fast-track access to the Louvre. You will still have to queue for security, but the fast track line is a lot quicker moving than the general admission line. When you think of France, a few things likely come to mind, and I suspect that wine is likely one of them. So why not take a break from the sight-seeing and museums, and indulge in a little wine tasting. The tour costs €30 including the wine tasting, and is included for holders of the Paris Pass. If you aren’t into wine tasting, there are a number of nearby cafes and restaurants where you can refresh and revive. We can recommend afternoon tea at Le Meurice, the Ritz or the Hotel de Crillon if you like afternoon tea (see our guide to the best afternoon tea in Paris if so). For a shorter and less expensive experience, the hot chocolate at Angelina Cafe is also superb. 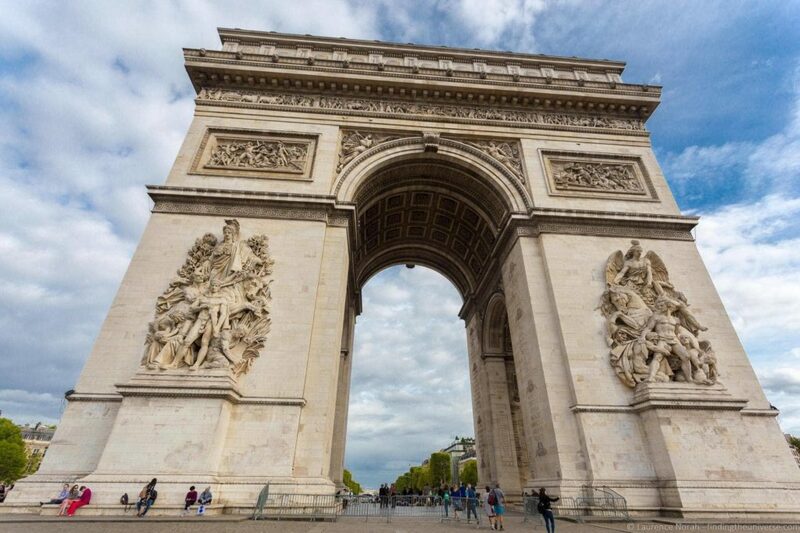 We’re going to finish off the second day of our three day Paris itinerary with a visit to the Arc de Triomphe, another of Paris’s iconic landmarks. From the Louvre you can either take public transport here, or you can walk up the Champs Elysees, Paris’s most famous shopping street. The Arc de Triomphe, built in memory of those who died in the French Revolution and Napoloenic Wars, is wonderfully photogenic. 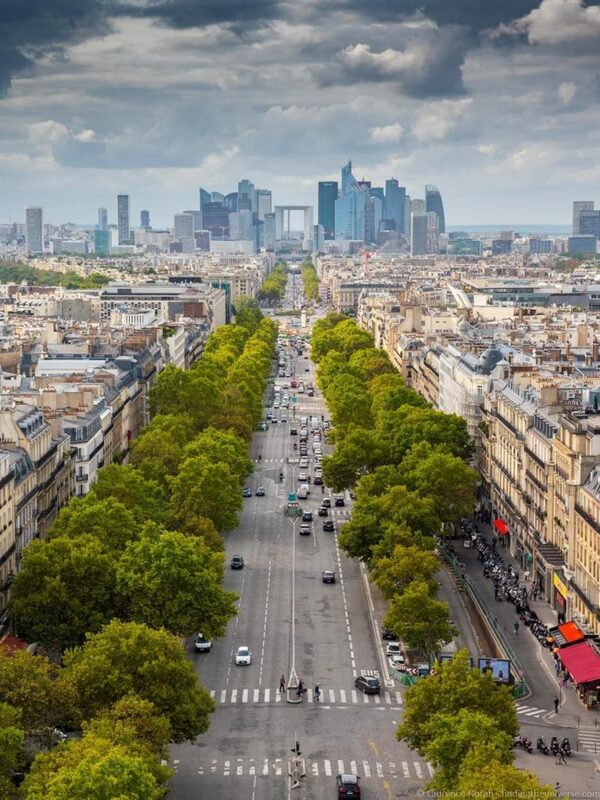 If you arrive in time, you can go to the top for an excellent view of the city, which includes the roads spanning out into the distance and the Eiffel Tower. As you journey up into the monument, you will also come to a museum which details some of its history. Below the monument, you will also find the tomb of the unknown soldier. To get to the Arc de Triomphe, don’t try and cross the traffic roundabout. Head to one of the underpasses, and cross in safety. Going up inside the Arc de Triomphe carries a fee, holders of the Paris Pass get free access with skip the line privileges. On the last day of our 3 day Paris itinerary we’re heading out of the city centre to take in one of Paris’s most famous Royal Palaces. We’re also including some extra sights in the city at the end if you can tear yourself away. The really nice things about having 3 days in Paris is that you have the flexibility to go a little further out of the centre. My suggestion for your third day is to visit Versailles, the incredible palace that was the seat of French political power and home to French Royalty, including Louis XVI and Marie Antoinette. To truly appreciate Versailles, I would suggest allocating at least half a day of your third day in Paris, if not more. There is easily enough to see here to fill an entire day, which is why we don’t recommend coming here on our two day Paris itinerary. We suggest starting off by touring the Palace. You’ll want to get here for opening time, as this is a really popular tourist attraction and it get busier as the day goes on. 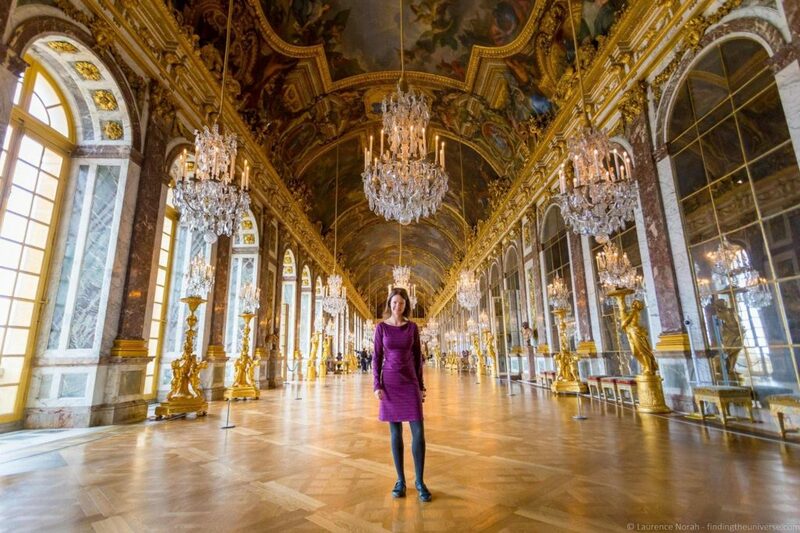 Once you have toured the Palace and seen such highlights as the incredible Hall of Mirrors and the Kings Grand Apartments, you can head outside, where there is a great deal more to see. A walk in the incredible (and vast!) gardens is a must. 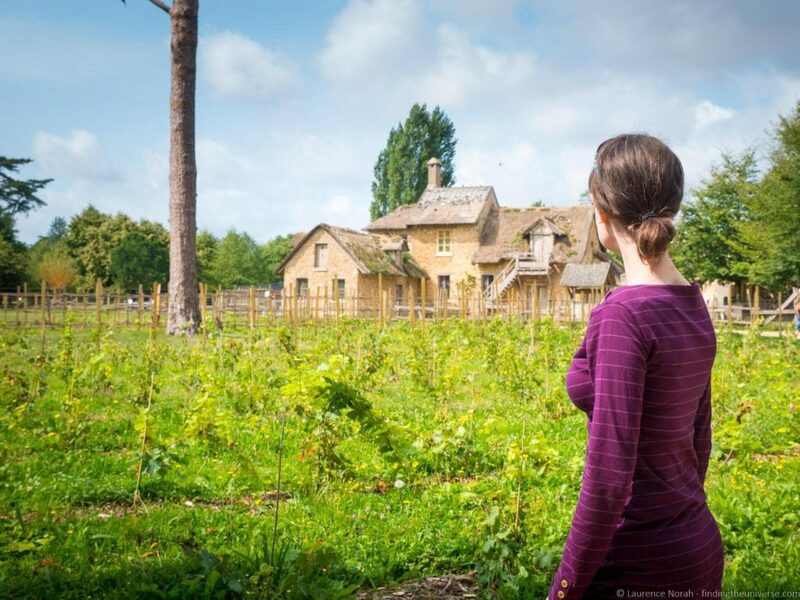 We particularity enjoyed heading over to Marie Antoinette’s estate, which is a slightly quieter part of the gardens, and home to a small model farm, tucked away temples, and walking paths. It’s very easy to spend a whole day exploring Versailles and the grounds, and don’t feel bad if you do, it’s totally worth it. Visiting Versailles is quite easy, you can get a train (RER C) from central Paris to the Gare de Versailles Chateau Rive Gauche, and from the train station to the Palace it is a well sign-posted ten minute walk. Fast-track entry to the Palace, Gardens and other Versailles attractions is included on the Paris Pass – although you will still need to join the security line. It’s worth pointing out that the travel card that comes with the Paris Pass does not include travel to Versailles. We saw a number of people trying to use this travel card to get through the ticket barriers with no luck. The Paris Pass travel card only covers zones 1-3 of Paris, which is sufficient for everything else on this itinerary, but not for Versailles which is in Zone 4. So you need to buy a ticket separately for your train journey – these are available from ticket machines at all the train stations, and these have and English language option available. If you manage to tear yourself away from Versailles, my suggestion for finishing off your last day in Paris is to head to the Montmartre region. 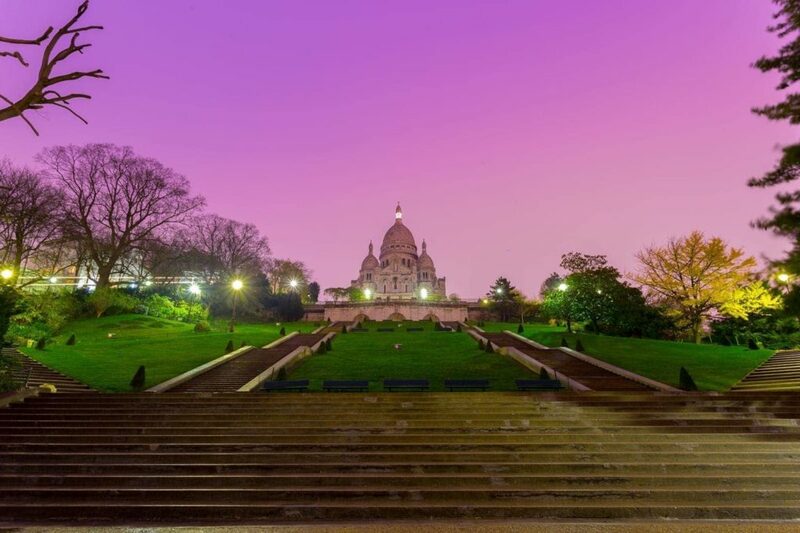 This is home to a large hill, atop which sits the glorious Sacre Coeur de Montmartre, another of Paris’s iconic buildings. This area of Paris was particularly famous as being home to artists, and folks like Dali, Picasso and Hemingway all either lived or frequented this area. It’s still popular with artists, and the Place du Teatre is the place in Montmartre is the place to go to get your portrait or caricature painted. Fans of Dali will also want to visit the Dali Exhibition, home of the largest collection of works by Dali in France. Montmartre is a maze of cute little streets, cafes and shops. The Basilica is free to visit, if you get here in time, although there is a small fee if you want to climb the tower. Montmartre is also a popular place to watch the sunset across the city, and what better way to finish your 3 days in Paris than by watching the sun set across this magical city from atop Montmartre? 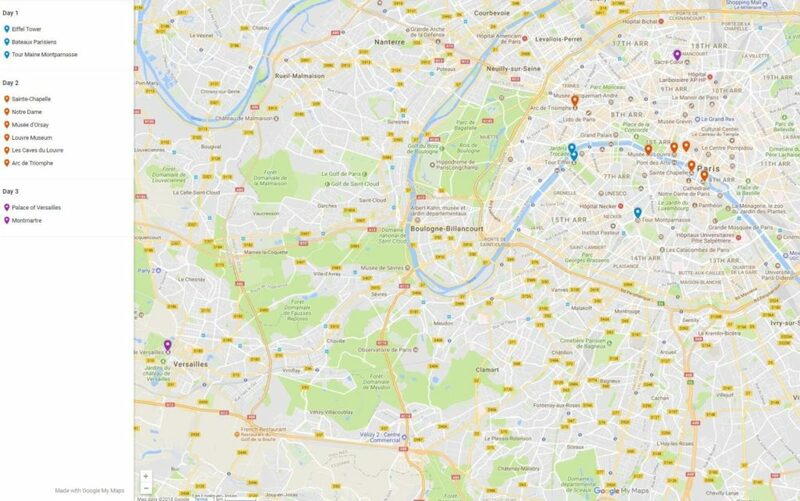 To help you visualise our 3 day Paris itinerary we’ve put together this helpful map which shows the attractions for each day. You can access this on Google Maps here. As you would expect from a major European capital city, Paris has no shortage of options when it comes to accommodation. We’ve stayed in a variety of places, from hotels to homestays to apartments. Ideally you want to be fairly central if you can, to minimise your travel time. Our suggestion is to take a look at the listings for Paris on booking.com. They’re our favourite booking engine when we travel, `usually giving us the best choice and the best prices. They also have everything, from apartments and hostels to high end hotels. 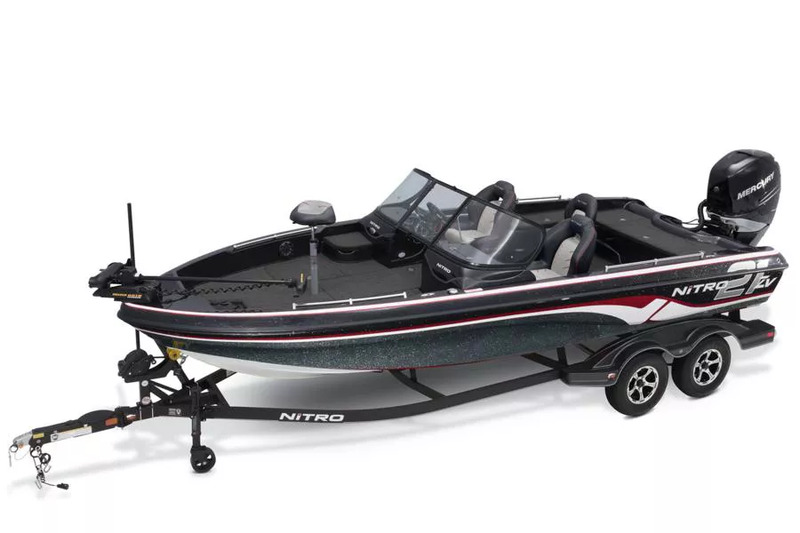 Here are some options we suggest, depending on your budget. Of course, there are lots of other options when it comes to finding accommodation when you travel. Check out our travel resources page for some of our favourites. We’re actually happy to visit Paris at pretty much any time of year, and this Paris itinerary would work at any time of year. 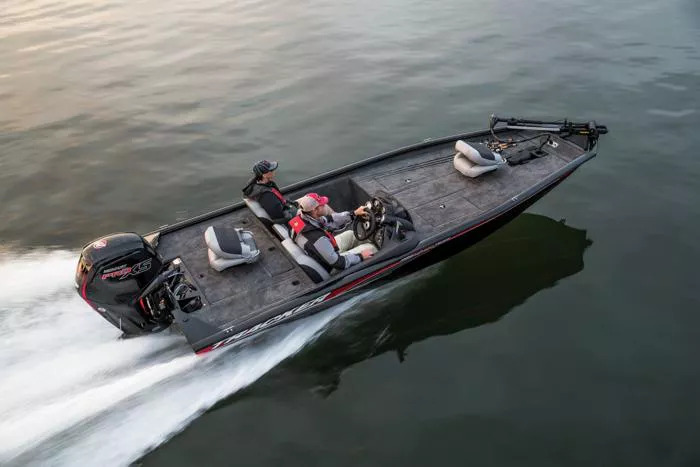 Summer brings sunshine and warmth, although of course the city is a lot busier at this time of year, so if crowds aren’t your thing, you might want to skip the summer months. We also love Fall and Spring in the city, when the temperatures are a bit cooler and the crowds less. In the run up to Christmas, the city is beautifully decorated and some of the stores in particular are worth visiting just to see the elaborate decorations they put up. After Christmas the city is a lot quieter, and of course temperatures are at their lowest. Ultimately, we think Paris is worth visiting whenever you can, so just decide how busy you can handle, and if you’d prefer it to be warm or cold, and go from there! As the capital of France, Paris has multiple options for visitors looking to visit. There are three major airports in Paris. Charles de Gaulle is the main airport for international arrivals, with Paris Orly being the second most popular international airport. Both of these airports are easily reachable by public transport from the city centre. Paris Beauvais-Tille airport is where you will likely arrive if you are flying with a budget airline. This is some way out of the city centre, but regular shuttles buses are available to take you into the city. Paris is also connected to the high speed French and European rail network, and there are a number of train stations in central Paris. You can even travel from the UK by train, taking the channel tunnel to do so. Finally, of course, you can reach Paris by car from France and the rest of Europe. Our advice would be to park your car in a secure long stay car-park on the outskirts of Paris and take public transport to the centre. We recommend against driving in the city centre, as public transport is cheap and fast, and a lot easier than stressing about driving around the crowded city streets, and trying to find a parking space. 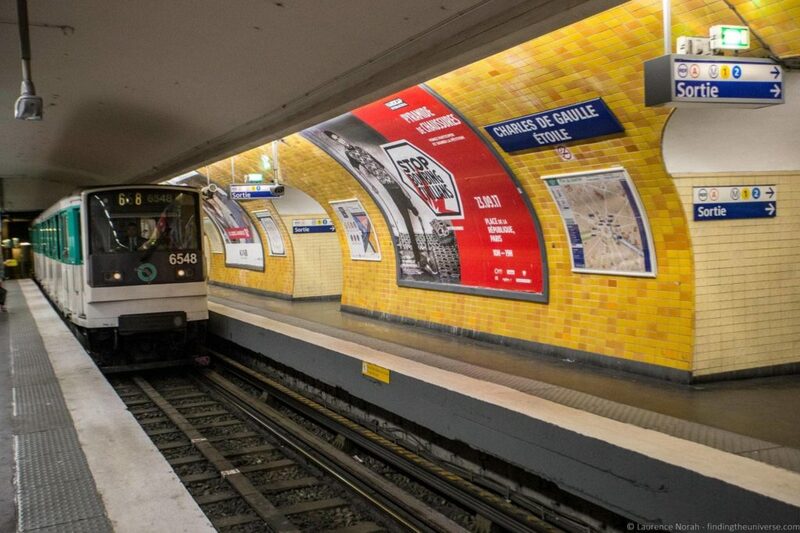 Paris has an excellent public transport network, and in particular the Paris Metro system is really good, getting you around all the major parts of the city at minimum cost. There’s also a good bus network, as well as local trains. For public transport, you can purchase t+ tickets which allow for one-off travel on the Paris bus, RER trains and metros. These are available at train and metro stations using the ticket machines. These machines accept both credit cards and cash, and can be configured for English language. Each ticket can be used for a single journey of up to 2 hours on the metro (including transfers) and 90 minutes on buses (including transfers). For more information on these tickets, see the official page. We suggest that you purchase them in packs of 10, which is much more cost effective than buying them individually. Alternatively, if you buy a Paris Pass, this come with a travel card which is valid for the duration of the Pass. So if you buy a 3 Day Paris Pass, it will come with a three day travel card. This will cover you for all your travel in Paris within Zone 1-3, so will get you nearly everywhere you need to go. Notable exceptions include Versailles and the Paris Airports, for which you will need a separate ticket. If you’d like to take a guided tour of Paris, the two companies we usually use are Take Walksand Context Travel. These both offer small group walking tours in Paris, which are a great way to learn about some of the sights and history of the city. Of course, if you decide to take a walking tour you will have to adjust the itinerary accordingly to suit. 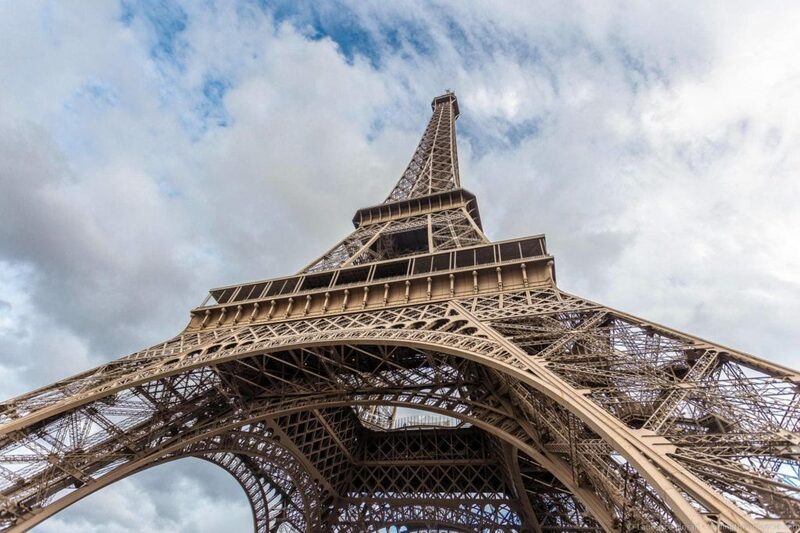 If you were interested in a tour, Take Walks has this Paris in a Day tour which includes a Skip the Line Louvre Tour, the Eiffel Tower, Montmartre & a Seine River Cruise – an excellent introduction to the city! Context travel offer a number of very focused tours of Paris, and these offer very specialised insights into particular subjects. We’d suggest maybe taking one of these for a specific area of interest that you really want to learn about, perhaps for Versailles. They also offer an introduction to Paris tour. There are of course other options for various tours in Paris, including all the tours on this page, which offers a variety of things to do from different providers. So definitely check out the options to figure out what is best for you! Being a major European city, Paris is definitely not a budget destination. There are a few ways to save money of course, even on an itineary as packed with attractions as this one is. Food is one way – rather than eating out for every meal for example, you could stay in an apartment or hostel that lets you cook your own meals. If that’s not an option, consider having picnic lunches or breakfasts, and eating out in the evenings. Also, keep an eye out for the “menu du jour”, most restaurants offer a fixed lunch or evening menu which includes a number of dishes at a fixed price. You can usually get a meal for between €12 & €18 which includes two or three courses, bread, and sometimes even wine or coffee. Check out our guide to the best restaurants in Paris for lunch deals. The cheapest way to get around Paris is to walk of course, followed by the excellent public transport system. We usually walk as much as we can, and then take the metro for the longer trips. Taxis can be convenient, but they will eat into your budget very quickly. One of our favourite ways to save money when we visit a major city where we want to see a lot of sights is to invest in a city sightseeing pass. 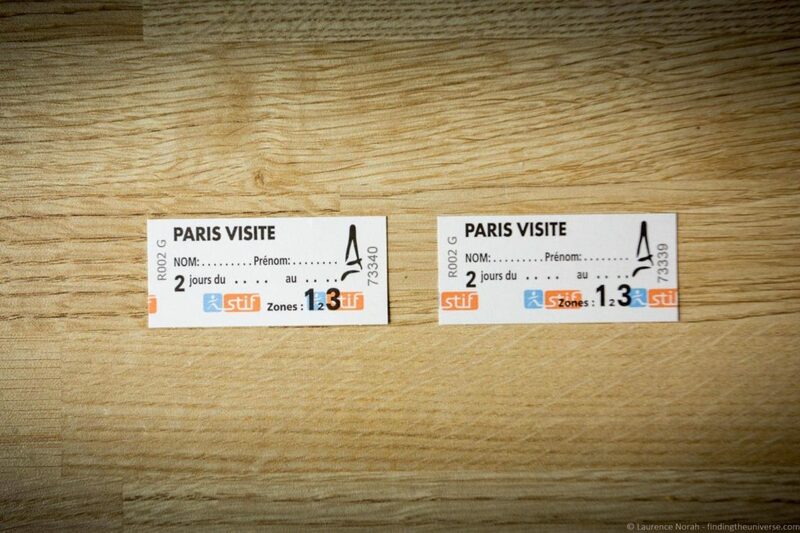 In Paris there are two main passes that we recommend, the Paris Pass and the Paris Museum Pass. 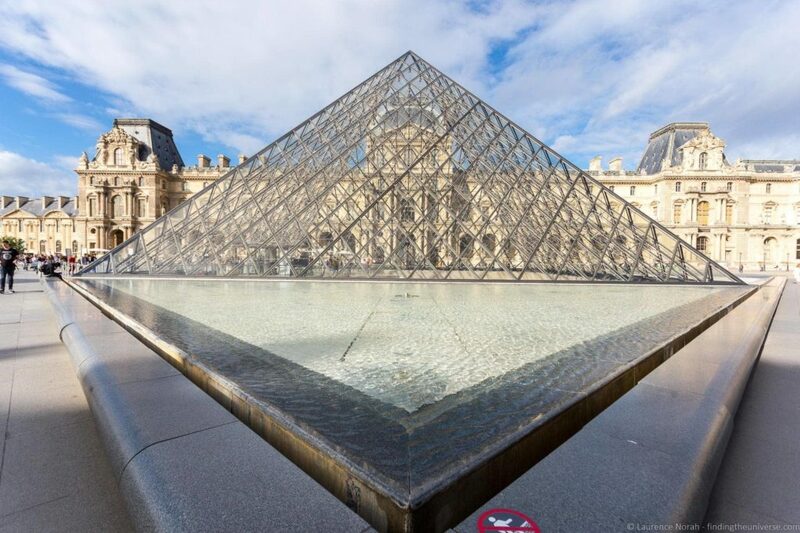 The Paris Pass actually includes the Paris Museums Pass, which gets you into many of Paris’s major attractions, including the Louvre and Versailles. 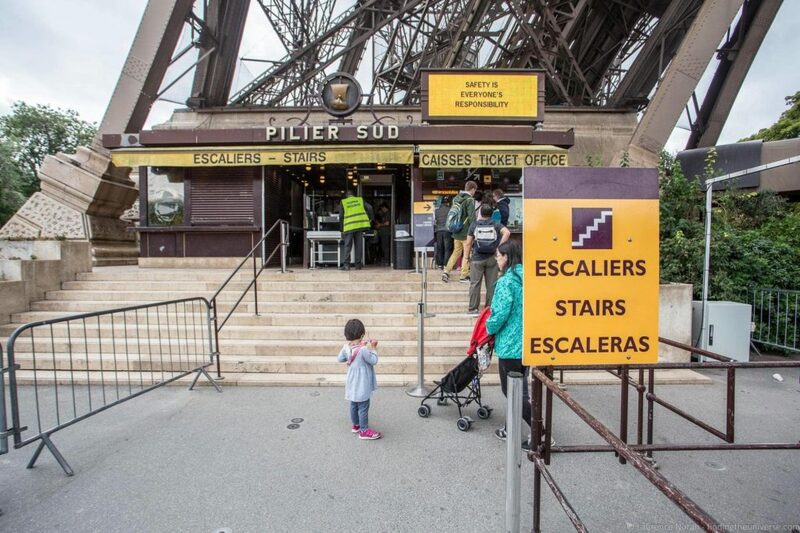 It also includes invaluable skip the line access to some of the major attractions in Paris. 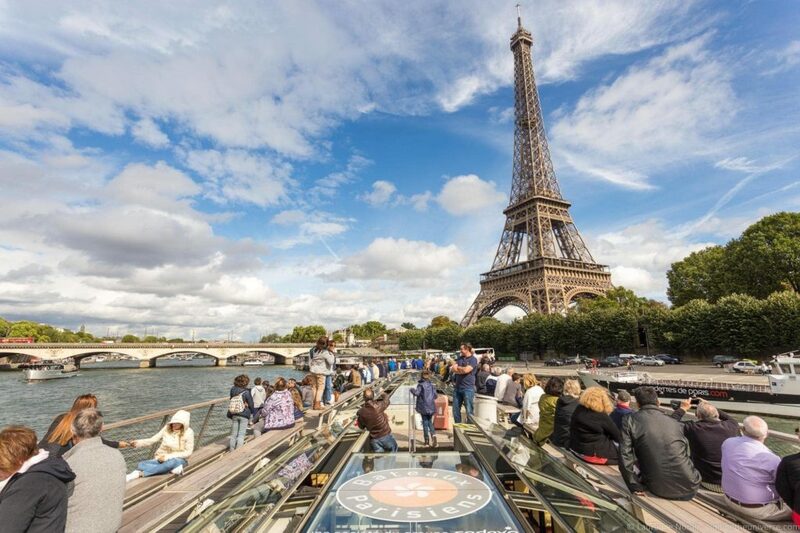 The Paris Pass also comes with a number of other benefits including a travel card for the duration of the pass, access to the hop on hop off bus, a Seine River cruise, a walking tour, wine tasting and many more. One thing to be aware of is that the three day Paris Pass, which we would recommend if you were to do this itinerary, only includes a 2 day Paris Museum Pass, as there is no three day Paris Museum Pass. So you would need to arrange your days to visit the attractions covered by the Paris Museum Pass over two days. I have in fact already done this for you in this itinerary. The first day includes attractions that are not covered by the Paris Museum Pass, whilst the second and third day include the main attractions covered by the Paris Museum Pass. As an idea of savings, if you were to visit all the attractions in this itinerary that are covered by the Paris Pass, plus buy a three day travel card, you’d be looking at spending over €220. A three day Paris Pass currently costs €165 – so that is a good saving! Of course, your individual situation will vary, and you might have different attractions you want to visit. In addition, you should be aware that if you are an EU citizen under the age of 26 that many attractions are free or discounted to visit (you need ID!). Also, on the first Sunday of every month, many museums are free to visit – although very crowded as a result! 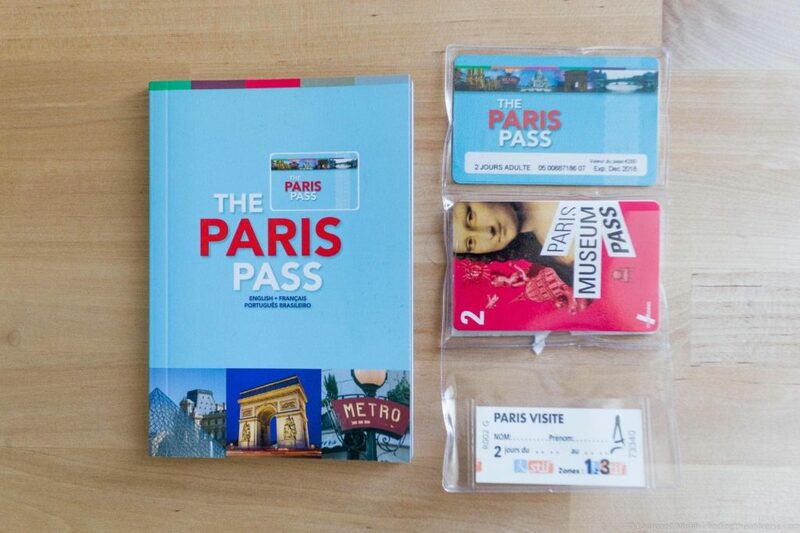 We think the Paris Pass is good value for money (click here to buy), but do feel free to check out our detailed review of both the Paris Pass and the Paris Museum Pass, and come to your own decision as to what works for you! Paris is a safe city in our experience, although it does have a reputation for being home to a number of scams. Most of these are easy to avoid once you know about them (read up on some of the common scams in Paris here). As with any major city, of course you need to keep your wits about you – keep your possessions in view all the time, keep your wallet or phone in a front pocket (with a zip if possible), and don’t do anything that you wouldn’t do at home. We’ve not had any problems in Paris, although there are a few scams to be aware of – check our guide to avoiding common Paris scams so you are prepared in advance. Electricity in Paris is of the 220v standard, with the 2 pin European style plug. Travellers from countries like the UK and the US will need an adapter like this. US travellers need to check their equipment supports the 220v standard – it will be written clearly on the power adapter. As a general rule, we have found that laptops, phone and camera chargers and other small electronics are universal, whilst larger devices like hair dryers and hair straighteners are not. Paris is part of the Eurozone, so the currency is the Euro. You can get Euros from ATM’s, banks and currency exchanges, although credit cards are of course widely accepted, and there is no need to carry large quantities of currency. Internet access is widely available in the form of WiFi all around the city and in hotels and coffee shops, so you shouldn’t have any trouble getting online. You can also pick up local SIM cards if you have an unlocked phone. Travellers from the UK on the Three network will be able to use their Feel At Home data, which is a great deal if you’re a regular traveller from the UK. The water in the taps in Paris is safe to drink unless otherwise indicated. If you don’t like the taste, bottled water is widely available. We usually recommend you travel with a re-usable water bottle like this to save on having to buy water bottles. If you want to eat at one of the more popular restaurants in Paris, we recommend that you book in advance. We recommend and use La Fourchette, which is the most popular online restaurant booking website in France. It’s easy to use and makes booking restaurants a breeze, especially if you don’t speak French. Check it out here to find reviews, sample menus and book a table. We have visited Paris on a number of occasions, and have written a good deal about our experiences in the city. To help you further plan your stay in Paris, here are some of our favourite posts and external resources. A guide to choosing a Seine river cruise, buying Paris opera tickets, attending a fashion show in Paris and our tips for the best restaurants in Paris for lunch. Joe’s Pizza was voted BEST ITALIAN RESTAURANT in Montgomery County, as well as ‘Number One‘ for Italian food in the greater Houston area, by KHOU-TV viewers. Eat at Joe’s Italian Restaurant in Conroe, Texas today, and discover for yourself why so many folks like eating at Joe’s Pizza. Who better to ask about the local, family owned restaurant than the guests? “Joe’s is Our ‘Go-To’ Lunch Place” — Whenever we are stuck for a place for lunch, Joe’s Pizza and Pasta always fits the bill. But, that doesn’t mean it’s the last choice, rather always at the top of our list. Their lunch specials are awesome and the fresh rolls are tremendously delicious. The service is always good and the owners/managers are always on site. The atmosphere could use a little sprucing, but you won’t be disappointed in the food. “The Best Italian food- our favorite restaurant” — My husband and I went to school at Sam Houston State University, and Joe’s became our favorite place! Every entree we’ve had has been excellent, but my absolute favorite is the spinach tortellini. When joking about if we had to eat one thing for the rest of our lives, it would definitely be a dish from Joe’s! We now live out of state, but any chance we get to come back to the Houston area, Joe’s is always on our list.